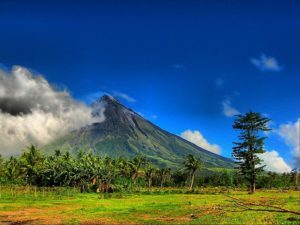 The Bicol Region lies on Luzon’s southern peninsula and is comprised of more than five million scattered six provinces – Sorsogon, Masbate, Catanduanes, Albay, Camarines Sur and Camarines Norte. There are loads of places to stay in Bicol from budget accommodations to luxury hotels and many tourist spots to offer like the world-famous, ever-active Mt. Mayon. The beaches on the region are haven and paradise for those who love the serenity of the sea. Bicolanos are also known for being religious and the majority of the people are devout Roman Catholics and this could be seen on their annual religious festival like the Penafrancia festival. One more thing that puts Bicol region on the map is their love of spicy food. Their culinary love affair would always include chili peppers and the native small ones (sili and siling labuyo) and coconut milk (gata) on the recipe. They love to show their hospitality by making their guests yearn for water. For the love of chilis, it can be cooked into almost anything – sautéed, with vinegar even on desserts. 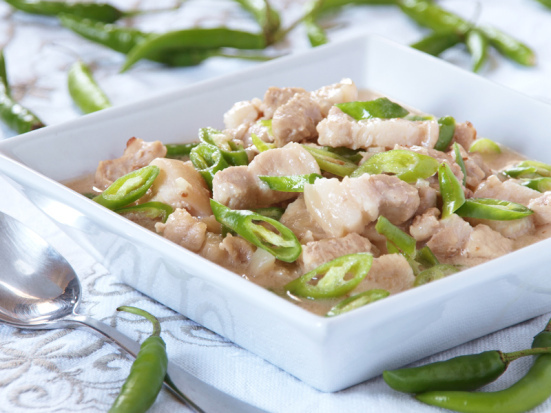 Pinangat or laing is a popular dish hailing its roots from Bicol. The sumptuous dish is made from pork meat, taro leaves, coconut milk and of course lots of chili. It is traditionally served in wrapped gabi leaves and coconut leaves are used to sturdily tie it up. The Pinangat is is so embedded on their culture that a festival celebrating its rich flavor is held annually in Albay. Another famous dish uniquely capturing the love of Bicolanos for their chilis and gata is the Bicol Express. It is stew with loads of ingredients like the long green chilies, shrimp paste, garlic, pork and loads of onion. This spicy tempting dish uniquely got its name from a joke among the locals – eating this dish would make you run for water as fast as the train itself. If your preference would be more into the healthy side of seafood rather than getting high with cholesterol, then Kinunot is your perfect dish. This Bicolano appetizer is made out of stingray and shark meat. However, since shark catching is already prohibited, kinunot, nowadays is made up of entirely sting ray meat. Aside from the regular chilies and coconut milk, Moringa (malunggay) leaves are a nice addition to the dish making it a little bit healthier too. Now if you want to try some culinary adventures, then go ahead and try their spicy ice cream. It’s your regular sweet creamy dessert topped with one or two spicy chilies. The confusion of the taste buds on your mouth is something everyone should look out for. Bicol is not just a nice place to visit for its scenery as its rich culinary culture will sure heat up your palate. Just be ready with a glass of water and you’ll be fine.